Six different car parks are available at Kotoka International Airport. The parking area provides 24 hours 7 days a week CCTV coverage, attendant patrols, improved lighting and safe pedestrian access to the terminal. Each Terminal has is own free passengers drop off area. 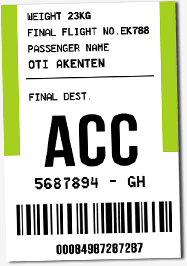 Taxis are available 24 hours a day at Accra International Airport. They don't have a taximeter so any ride must be negotiated with the driver before entering the vehicle. Accra is a large city, and the price and the ride time (15 to 40 minutes) depend on the distance to the destination area and on congestion of the streets. Metered taxis operated by Labour Enterprise Trust charge passengers as follows: GH¢ 10.00 for the 1st kilometer and GH¢ 0.10 for additional 100 meters or part thereof. You can find them in car park 5. Uber is also available in Accra. Frequent buses and coaches link Kotoka International Airport with the city center and destinations across Accra and other regions of Ghana through an extensive bus network. Bus stop for public network is located just 500m from Terminal 2 on Liberation Road. Several car rental companies offer their services in Ghana. Some of them have an office in Accra International airport where to pick-up your car 24h a day and others provide you with the car on your arrival.